Published: Dec. 27, 2016 at 02:03 p.m. Updated: Dec. 27, 2016 at 02:13 p.m.
Bowl season ramps up on Wednesday, as the top defender in college football and several other future pro starters will be on display. Here are my top 10 prospects to watch on hump day of this bowl week. All times listed are Eastern. 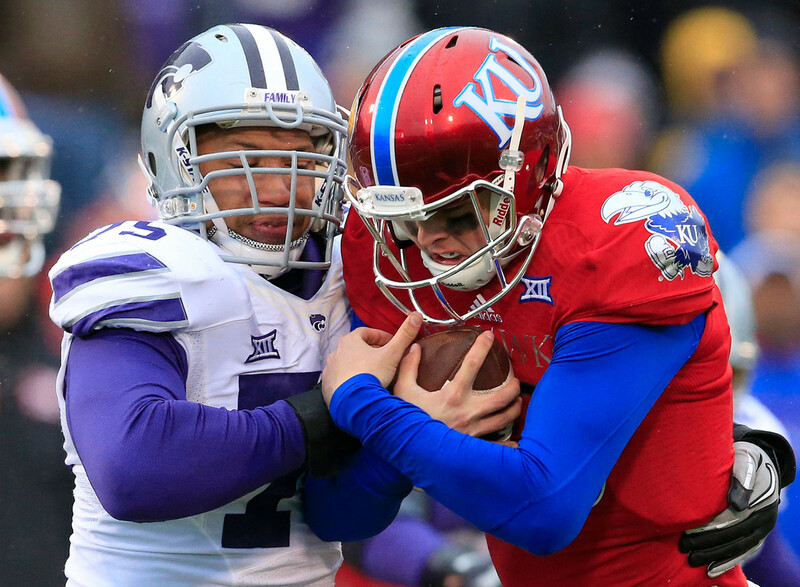 The Wildcats' defensive star ranks in the top 10 nationally with 11.5 sacks. The first-team All-Big 12 pick is a pure strong-side end with power to drive his man into the quarterback. Willis won't wow scouts with his change-of-direction skills, but the ability to hold the edge is crucial for success in some schemes -- the senior end can do just that. With a strong performance vs. the Aggies, Willis might get an early-round call. Johnson isn't quite as highly regarded as Indiana OG Dan Feeney, but I still see an excellent combination of athleticism and strength in his skill set. In fact, pro offensive line coaches would be pretty happy with Johnson at left guard and Feeney at right. When Pitt's offense is rolling, it's running behind Johnson and left tackle Adam Bisnowaty, another senior with a shot at an NFL career. Scouts will be focusing on that side of the line in the Pinstripe Bowl. This former junior college All-American was one of the top risers this season among all draft prospects. He's tied for the FBS lead in interceptions with eight in his first year as a starter for the Mountaineers. NFL teams listen when you're talking about a 6-foot-2, 203-pound cornerback who runs with receivers down the sideline; if that same guy has the ball skills to secure eight picks, you've definitely got their attention. Miami QB Brad Kaaya will challenge Douglas at some point in the Russell Athletic Bowl, and the result might be the difference in the game. This two-time All-Pac-12 pick missed a couple of games this year due to injury, but he has been a factor in coverage and run support since his freshman year. His speed in the back half has allowed him to intercept nine passes in the past two years. Williams' size (6-1, 195) and secure tackling should put him in a starting free safety spot immediately at the next level. The Hoosiers would prefer OL Dan Feeney match up inside with Lotulelei (low-too-le-lay) -- though they also need him outside to corral high-motor end Hunter Dimick, who could have easily been on this list after recording 14.5 sacks this season. The brother of former first-round pick Star (Panthers), Lowell is a nose tackle who can eat up space, but also possesses enough quickness to win a gap at the next level. NFL teams looking for a potential long-time starter in the middle of the defense will be watching Lotulelei closely. Njoku is the next athletic Miami tight end working his way to the NFL. He won the national high school championship in the high jump in 2014, and now leaps over defenders when trying to find the end zone. He's averaging 17.2 yards per catch for his career, which shows that he can get downfield before or after the catch using that athleticism. NFL offensive coordinators are already checking out the redshirt sophomore. General managers looking for a difference-maker at the safety position are excited to see Evans show off his athleticism and aggressiveness in this game. The second-team All-SEC pick is a big hitter when free to attack downhill. Evans hasn't made as big of an impact since the midway point of the season, and missed some tackles in conference play. A big game vs. Kansas State would be reassuring for scouts. Feeney is one of the top two or three guards in the country, and he's ranked first at the position by many. He's had to play right tackle for the Hoosiers recently, though, due to injuries on the line. Scouts won't worry too much if he's exposed a bit against Utah's pass rushers in the Foster Farms Bowl because they know Feeney is a technically sound lineman with upper-body strength to move his man out of the hole when he's at his natural position (guard). He's likely to be a top-40 pick. Kaaya is Miami's all-time leading passer. Opinions are split on his NFL future, though. West Virginia will be coming for him, making the junior prove he can move effectively within the pocket while keeping his eyes downfield to make a play. If Kaaya gets the ball out before that pressure arrives or avoids pressure to use his pro-caliber arm to stretch the field, he'll impress scouts. Garrett is regarded as the best player in college football by many NFL scouts. Injuries have limited his production in the second half of the year, save for a four-sack effort against undermanned Texas-San Antonio. The Texas Bowl gives him a chance to show scouts that the high ankle sprain that bothered him throughout October and November is a thing of the past. When healthy, he's an explosive pass rusher and relentless rush defender with an excellent NFL future.